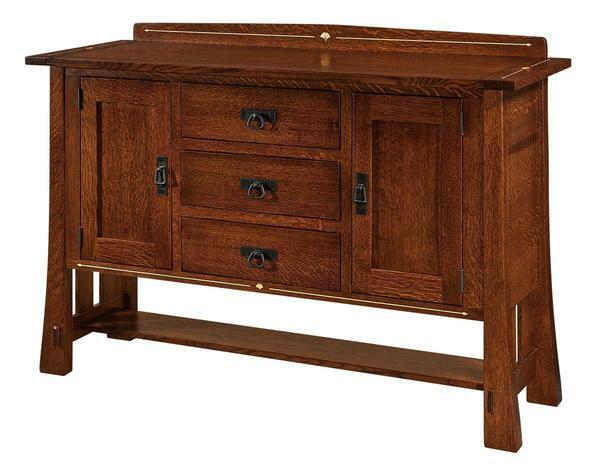 This beautiful Mesa Sideboard is handcrafted in the popular Mission style with meticulous attention to detail by our talented Amish woodworkers. The signature feature of this American made sideboard is the yellow heartwood inlay that is placed along the backsplash, top, & bottom edge to create an elegant touch to this solid wood dining sideboard. With three drawers and two doors, there is plenty of room for your dining essentials. Buy it as shown from the pre-configured options above or as a set on our Shop-The-Look page with the matching Mesa Mission Trestle Table & chairs.